By now the gentle reader knows what an unrepentant grouch Walhydra wants everyone to think she is...but there's an odd little Celtic cross-quarter sabbat which always manages to get her feeling like, well, maybe all is not lost. It's called, variously, Imbolc, the Feast Day of Brigit (with various spellings), Candlemas, Groundhog Day, etc., etc., etc. The one from which she stole...uh, borrowed...the accompanying image is celtictale.com. Another source she likes—since she's always liked Mike Nichols' writing—is Candlemas: The Light Returns. 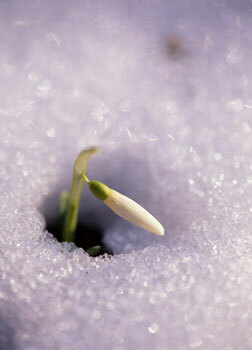 Then there's this one: The Celtic Year: Imbolc. But today, the piece which moves her the most comes from Sara Sutterfield Winn's blog, Pagan Godspell. Imbolc is a time of quickening—the flexing and stretching of the sleepy Land as it stirs slowly awake, letting out a cold breath or two, murmuring and sighing—a seed of light in the dark. The Festival of Lights—a branch decorated with lit candles. After the explosive gorgeous moment with the sun cracks over the horizon on the Solstice, everything seems to fall into a lazy, somnolent torpor during January—exhausted from the frenzy of Misrule, of feasting and partying and dancing and giving gifts. But the Land stirs nonetheless, and as February approaches I am ready to embrace Newness and the fresh promise of spring, even if it seems remarkable distant as we sit beneath layer after layer of cold snow. Beautiful. Thank you, thank you for sharing that.